A fund has been instituted by Sivakamu Jayaraman (Vidyaa Visharada Nidhi) and is to be continued to be used for awarding cash prize to the highest ranked student in the science stream and the top two ranked students in the commerce stream for their excellence in 12th standard Tamil Nadu Board Public Exams. A fund has been instituted by Kamala Renuka (Vidyaa Visharada Nidhi) and is to be used for awarding cash prize to the second to the sixth ranked students in the science stream and the third to the sixth ranked students in the commerce stream for their excellence in 12th standard Tamil Nadu Board Public Exams. i) ₹1000 each to 60 students towards School Uniform. i) Mr. Suren (London) has sponsored all the educational expenses for educating a girl from 6th to 12th Std (7 years) in our School. ii) Mr. K.L. Nagarajan (Chennai) has sponsored all the educational expenses for educating a girl from 6th to 12th Std (7 years) in our School. iii) Mr. Sundaram Kumar (Chennai) has sponsored all the educational expenses for educating a girl from 6th to 12th Std (7 years) in our School. iv) Sri. 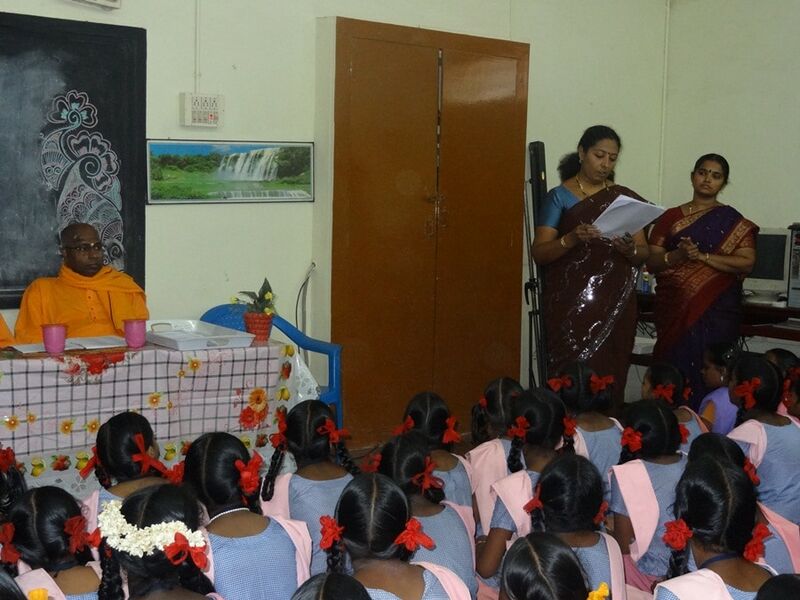 D. Sukumaran has sponsored two Girls’ Students all the educational expenses for educating them from 6th to 12th Std. in our School. v) Smt. Lalitha Jayakumar (Chennai) has sponsored for a student’s education from 6th to 12th std. (7 years) in our school. vi) Sai Surya Medical Trust has sponsored four Girls’ Students all the educational expenses for educating them from 6th to 12th Std. in our School. vii) Sri K. Kannan (Chennai) has sponsored all the educational expenses for educating a girl from 6th to 12th Std. (7 years) in our School.